STEM Clubs Week: Celebrating STEM Clubs! We are excited to announce the launch of STEM Learning’s new STEM Clubs programme this February. The UK STEM Clubs programme, led by STEM Learning, can support you to take the next step. They have developed an inspiring series of free resources to help you link your STEM Club to topics of real interest to your club. 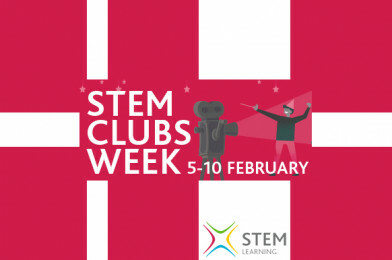 To support the launch, they are running STEM Clubs Week; celebrating the wonderful, fun, stimulating and creative work clubs do across the UK. Celebrate your STEM Club by entering their photo competition. Send a photo of your most weird and wonderful club activities and they will select a winner at random to receive a prize. It’s free to enter and all you need to do is upload your pictures to their community board and share your stories. Join STEM Learning on Facebook on Monday 5 February. Simon Quinnell, STEM Learning’s National Technician Lead, will be doing a demonstration of the new activity – Is there witchcraft and wizardry in the real world? Test your knowledge in the daily STEM Learning Twitter quiz. With questions based on STEM subjects, anyone can play along and subject specialists will be on hand each day to steer you in the right direction. STEM subject themes will be featured throughout the week, appealing to all STEM Clubs, including resources, support packages, careers and STEM Ambassadors. Whether you are setting up a new STEM Club or are looking to refresh an existing one, celebrate your STEM Club during the 5-10 February 2018 and take advantage of a new free resource package. Discover the exciting world of STEM through STEM Clubs! Based in Merseyside or Cheshire? Tweet @MCSTEMHub too, we would love to share your STEM Club Week activities and shout about your success!